three star hotel with view of Euiam lake! 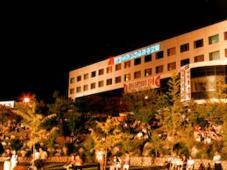 Chuncheon Bears Tourist Hotel first opened its doors in 1990 as the "Rio Tourist Hotel", then the name was changed to "Chuncheon Bears Town Tourist Hotel" in 1995 and finally came to hold the current name in 2001. Situated overlooking Uiam Lake, this resort hotel has the best views in the Chuncheon region including nearby Soyang River Dam, Cheongpyeong Temple, Mt. Samak, Gugok Falls, Gangcheon, and Jungdo Amusement Park. Leisure sports such as fishing, motor boating, golf, clay-pigeon shooting, hiking, waterski, and more are available. The guestroom view of the sunset over Lake Uiam adds to the serene ambience of the place. Lake Uiam changes its colors along with the seasons- you can enjoy the cool waters in the summer, magnificent autumn leaves in the fall, and sparkling snowfalls in the winter. With Jungdo and other waterside parks nearby, there are numerous cuisines and festivities to experience!